People at the New Hampshire Retirement System are quick to point out that investment returns from year to year can fluctuate widely. Case in point: spokesperson Marty Karlon says, during the previous fiscal year the NHRS grew by 23 percent. Karlon: We’re looking at about 11.8 percent over the three year, so taking one year at a time whether it’s a great year or a difficult year, it’s kind of hard to use that one year without looking at the big picture. Karlon says last year’s poor returns can be blamed on unstable market conditions caused by events like the debt ceiling showdown and the ongoing European debt crisis. 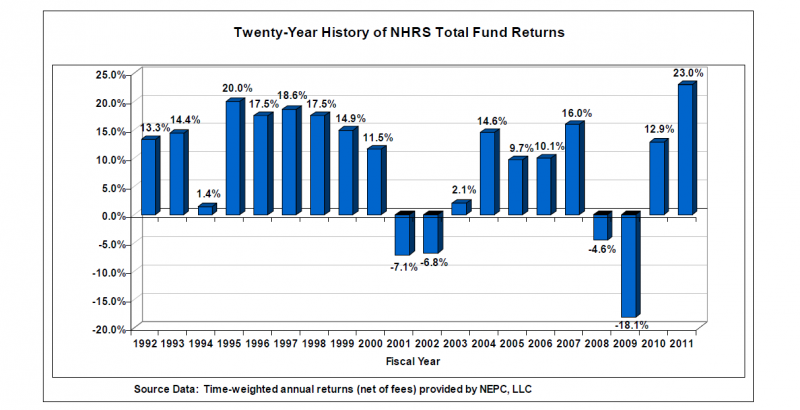 Since 1992, the fund has averaged 7.8 percent, which is just better than what the NHRS funding formula hopes for.